US foreign policy is so detached from reality that it has become literally insane to a worrying degree. The United States is starting to live up to the ancient Greek stereotypes about the Achaemenid Persian Empire, namely that in spite of its strength, its rulers are brash, unrefined, thirsty for blood and tactically unsophisticated. This stereotype, largely taken from the words of the historian Herodotus was never fully true, but from a philosophical standpoint, the idea that the Greeks and the Athenians in particular were a more refined society than their Persian enemy can readily be applied to the dichotomy between Russia and China on one hand and America on the other. This is in no way meant to be an insult to modern Iran which is clearly on the side of civilisation against the forces of western barbarism. In foreign relations, the United States has largely invented its own gods and shibboleths: it adheres to its own mythical conception of reality as though it was divine truth and operates on the principle that can increasingly be defined as “War is peace. Freedom is slavery. Ignorance is strength”. In this sense, modern America is one part Herodotus’s conception of the ancient Achaemenid Persians and one part George Orwell’s bleak view of a distopian future. Under the Donald Trump administration, America’s foreign policy has retained the smug exceptionalism of the Obama years, while it has adopted a patronising and condescending tone towards other powerful nations, including the other super-powers of the world. While the tone is grating, the over-all conclusion as well as the means of America’s foreign policy making are looking not only barbaric but also insane in a literal sense. They are detached from reality so much so that one could summarise US foreign policy by imagining a doctor proscribing full leg amputation to a patient diagnosed with a broken finger when in reality the patient’s only ailment is that the doctor himself has hit the patient’s hand with a sledgehammer. Before moving on, it is necessary to say that I am a Trump supporter. In domestic affairs and in terms of his personality, I admire the man and his accomplishments. But in terms of the foreign policy which has transpired under his administration, I am deeply sickened. My wish is not for Trump to be discarded but for him to understand why in terms of foreign policy his country has lost the plot entirely. Whether he can actually do anything about it is another matter. Just as chemical weapons, including mustard gas were banned after the First World War, something even Adolf Hitler acknowledged and adhered to, it is high time to internationally ban the use of sanctions, the uncontrollable killer of the current age. One need only to look at the US led sanctions against Iraq in the 1990s to realise that sanctions are not a means of preserving a difficult peace, but instead a means of conducting atrocities without having to waste bullets. The sanctions on Iraq during the 1990s led to the death of more Iraqi children than any war in the 20th century history of Iraq. Only the 2003 illegal US-UK war on Iraq killed more. The sanctions crippled a wealthy state leading to hunger where there was never hunger, a lack of medicine in a nation that could easily afford the world’s best medicines and suffering where even at the height of the dreadfully ill-advised (western advised) Iran-Iraq war of the 1980s, Iraqis continued to live normally by comparison to the 1990s. Today in Syria, the real humanitarian crisis is caused less by al-Qaeda, FSA and ISIS, bad though these jihadist groups are, than that which is being caused by US imposed sanctions. Syria can, even now, afford medicines and food, but much of this is out of reach only because of US sanctions. No geopolitical goal can justify these crimes against humanity and as it is, the US goal of replacing a secular, tolerant, pluralist government in Syria with one led by Salafist barbarians is far from a noble goal to say the least. The fact that such a regime change is against international law is simply extra-credit on the exam of morality that the US has clearly flunked. But not content with having sanctioned Iraq and sanctioning Syria, now the United States wants to sanction and starve North Korea. Ironically, according to the US, North Korea is already starving, a factually untrue statement, but by sanctioning North Korea further, the US could in fact begin to starve North Korea. This is one of the reasons that Russia and China oppose sanctions, it is about morality as much as it is about respectful diplomacy for a country which hasn’t engaged in a single active armed conflict during an era when the United States has engaged aggressively in over 10. The Charter of the United Nations remains one of the noblest documents written in the modern age. The aims and goals of the document are to prevent war and ensure the best possible peace for all men, women and children and for all nations. The fact of the matter is that the United States and its increasingly small number of allies have turned the UN into a body that can either rubber stamp America’s singular vision of world dominance or else be permanently paralysed. When America is able to force one-sided resolutions through the UN, the US hides behind these resolutions even when they justify American violence rather than any objective understanding of peace. 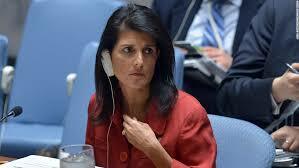 When the US does not get its way, the US says the UN has no credibility. Shame clearly isn’t a word that American ‘diplomats’ are familiar with. In her recent remarks on North Korea, America’s Ambassador to the UN, Nikki Haley spoke of the UN’s credibility being in jeopardy if it does not act on North Korea. When Haley says ‘act on North Korea’ she means rubber stamp American imposed sanctions with the additional threat of war against a country that does not objectively threaten anyone. Of the two competing states on the Korean peninsula, only one allows a country with enough nuclear weapons to destroy the world several hundred times over to place weapons of mass destruction on its soil (the THAAD missile system) and that country is not North Korea. That being said, South Korea is not stupid enough to reignite the Korean War and nor is North Korea. America by the admission of Nikki Haley is stupid enough to take military action on the Korean peninsula, something which would de-facto mean the end of the ceasefire in Korea which has held since 1953. What kind of world is one living in when one country and its few lackeys can turn a body designed to preserve the peace into one designed to rubber stamp war and savage sanctions? This is not world government as some on the American anti-war right say but nor is it peaceful diplomacy. It is American led global Apartheid where there is one rule for the US and its allies and another for everyone else. For those on the American anti-war right complaining about how much the US pays to the UN, if paying to get what you want is how one measures a good deal, America ought to be happier than a pig swimming in excreta. While most US foreign policies have remained the same under Trump as they were under Obama, one thing has changed and it is not an improvement. America now patronises and condescends to the other two world superpowers more so than under the Obama regime and that is really saying something. Donald Trump’s Tweets demanding China fix the ‘North Korea problem’ and on America’s terms no less, fail to acknowledge that both China and North Korea are sovereign states, neither of whom share each other’s vision for the world let alone America’s vision for the world. China is rightly incensed by this attitude as any nation would be. 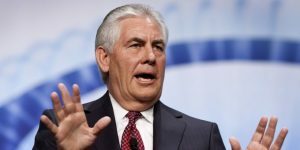 To add insult to injury, now US Secretary of State Rex Tillerson has stated that Russia has a “special responsibility” to insure peace in Syria. This is not only an insult to Syria’s sovereignty and to Syria and Russia’s partner Iran, but it is an insult to Russia. Russia’s responsibility is only to Russia and her voluntary partnership with Syria is a matter of bilateral security, not America’s perverse metaphysical vision for the universes. What is this, kindergarten? “Johnny, because Billy is mentally retarded you have a special responsibility to make sure he doesn’t make a mess in the school lavatory”. This is not a way to speak to a sovereign nation, let alone a nuclear superpower. Making things more awkward, Tillerson actually believes that the US and Russia could create a joint no-fly zone. Of course, America’s conception of a no fly zone is one in which only American an allied planes would be allowed to fly. If America and Russia were to create this mythical no-fly zone, whose planes would be grounded? Would Syrian planes by grounded in Syria at the insistence of a Syrian partner? Would Russia also work with the US to ground the planes of its Iranian partner in the war against terrorism in Syria? What about the only planes currently flying in Syrian airspace illegally, those of the US, its allies and the unilateral air movements of Turkish and Israeli jets, who would ground them? This idea of a joint Russian-US no fly zone is not only patronising and insulting to Russia and her allies, it is downright absurd. When Donald Trump said he wanted to work with Russia, if he meant Russia submitting to America’s increasingly preposterous terms, he was simply deluded, perhaps a victim of bad advice or a victim of lack of experience in foreign affairs. The increasingly unhinged Nikki Haley has repeated that threatening North Korea with sanctions and war will help the North Korea people. In what world has war ever helped anyone? War is a necessary evil to be used only in self-defence. The UN itself was created and its charter written after the biggest war in human history in order to prevent such suffering. Russia could constantly take a position of moral superiority because it did the lion’s share of fighting against the fascist aggressor during the Great Patriotic War, but Russian diplomats do not do this. They honour their history but when it comes to foreign policy making and diplomatic engagement they live in the present. What makes the United States feel that war is somehow a way to help people? This is literally insane. If a common criminal went before a judge and said, “I killed half of someone’s family in order to help the family”, the judge would transfer the man from a regular prison to a prison for the criminally insane. The lesson of the Second World War/Great Patriotic War is that international mechanisms must be in place to foster cooperation and respect between nations in order to avoid mass murder on a global scale. Instead, the lessons that the United States takes is that preemptive war is somehow a magical solution to solving disasters which have not yet happened. Only Israel and some of America’s western European allies share such a delusional view of the lessons of history. War is not peace: war is hell and this seems to be where America wants to send any country that doesn’t march to the rhythm of its war drum. The American Protestant Minister Norman Vincent Peale once wrote a self-help book called ‘The Power of Positive Thinking’, which argued that a positive attitude can overcome depression and material despair. The reality is that in modern America, there exists an attitude which suggests that realism is somehow negative thinking and that positive thinking is carte blanche allowing the positive thinker to do whatever the hell he or she wants. This is not only deeply dangerous but it is un-Christian. Christianity teaches compassion for the weak, not violence towards the defenceless. Christianity is about fearing God, not having the confidence to play God. Christianity is about loving one’s neighbour, not bombing one’s neighbour. The idea that anything which gets in the way of one’s positive view of one’s self should be cast aside is more akin to the fascist conception of a master race than to Christ’s teachings of humility before God and Christ’s teachings of charity for one’s fellow man. Yet America thinks it has a monopoly on its own very perverse version of violent, intolerant Christianity too….how dreadfully pessimistic indeed. America seeks to humble the world, but it is the US which ought to learn humility. Positive thinking has its limits. When one is behaving violently, irrationally and insanely, one cannot justify this using the power of optimism. One needs a thorough self-examination, something America looks increasingly incapable of. Through all of this, America has become everything it was supposed to hate: a global imperial power whose own people are taxed to death in order to fund a violent war machine. This piece is not an anti-American argument, it is the opposite. America is in a fortunate position in that by changing its barbaric foreign policy, it could help bring peace to the world and prosperity back to its own people. Far from being an unusual concept, it is one of the things Donald Trump campaigned on. I still believe Donald Trump is a good man, but he is surrounded by idiots, bandits, lunatics and criminals. He ought to remember his famous catch phrase and say ‘You’re fired’ to such people. America needs to step back from its position of barbarism, it needs to act more like the Greeks as portrayed by Herodotus, rather than in the manner of their enemies. Obama’s weakness is to blame for Russia, China and Iran flexing there muscle, so don’t blame Trump for this mess!